Over the past century, advances in technology and imaging have allowed scientists to peer deeply into the non-visible areas of the electromagnetic spectrum. Viewing an object in different wavelengths reveals much about its composition and the EM spectrum itself. 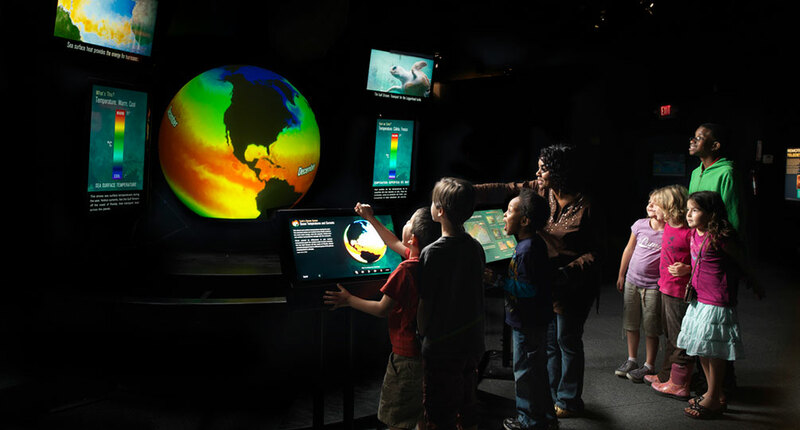 Building on this now-common concept, we developed the EM Spectrum exhibit which now appears in museums, planetariums, and other informal educational institutions around the world. Ideum sells this exhibit bundled with the Ideum 100” dual 4K UHD Pano multitouch table. 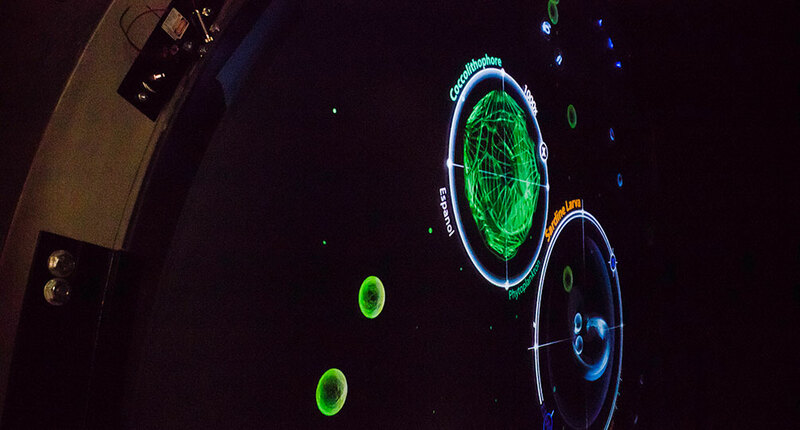 For this exhibit, we developed custom software which allows visitors to view both terrestrial and celestial objects across different wavelengths. All of the content was developed specifically for the application. As part of the process, Ideum conducted a multispectral photo shoot for terrestrial objects and helped collect the latest celestial images. We also worked with museum partners to locate appropriate images for the exhibit and collaborated on the content and text descriptions. 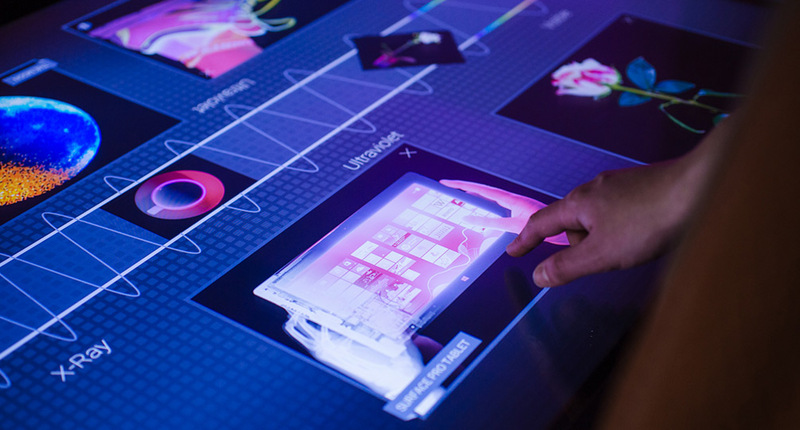 As visitors approach the exhibit, they see thumbnail images of a range of objects move along the center of the touch table across the spectrum, changing in unexpected ways as they move from wavelength to wavelength. Visitors can pull images toward themselves to examine them and move them through the spectrum. A “feathered edge” transition allows visitors to examine subtle differences between the images. 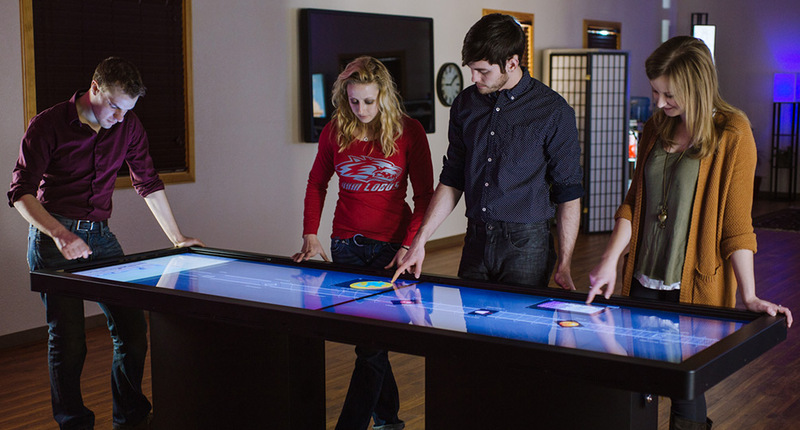 Museum visitors can share images with others across the touch table. In fact, the Pano table is so large it comfortably supports up to 8 people simultaneously. The high-resolution displays show enough detail that visitors do not need to scale images. Contextual descriptions for the images can also be viewed in each wavelength. An end-panel provides more general information and images for each wavelength. Here, visitors learn more about gamma rays, X-rays, ultraviolet radiation, visible light, infrared radiation, and radio waves, and how each wavelength is imaged. Designing and developing this experience is close to our hearts because it combines intriguing technical opportunities with innovative and engaging ways to help people learn more about the world around them. Stay tuned here for more information about our educational exhibits!